Golf is one of the sports that’s easy to pick up, but difficult to master. Unfortunately, not everyone has the time to drive all the way to the nearest golf course in Las Vegas and practice. This is especially true if you aren’t particularly confident in your game just yet. Fortunately, there’s a fantastic solution to this problem: build a practice course in your backyard! Redesigning your backyard landscaping to accommodate a small putting green is relatively simple provided you have the space for it. This is the perfect place to hone your game just in time for the next company golf tournament or a quick game with a client. There are many landscaping companies throughout Las Vegas, but not all of them will know how to build you a proper backyard putting green. With that in mind, you’ll definitely want to go with a landscaping service that has worked on several backyard putting greens in the past. Not only will they know how to get the job done, but they can also provide you with valuable design insights that you may not have thought of at the beginning. Naturally, you’ll want to recreate the conditions of your local golf course as much as you possibly can–and one of the best ways to do that is to have quality artificial turf installed. An experienced landscaping company, such as Las Vegas Artificial Grass Pros, can easily recommend and install high-quality turf. This way, you can be confident that every shot you take will yield the same result, whether you’re at home or out on the course. 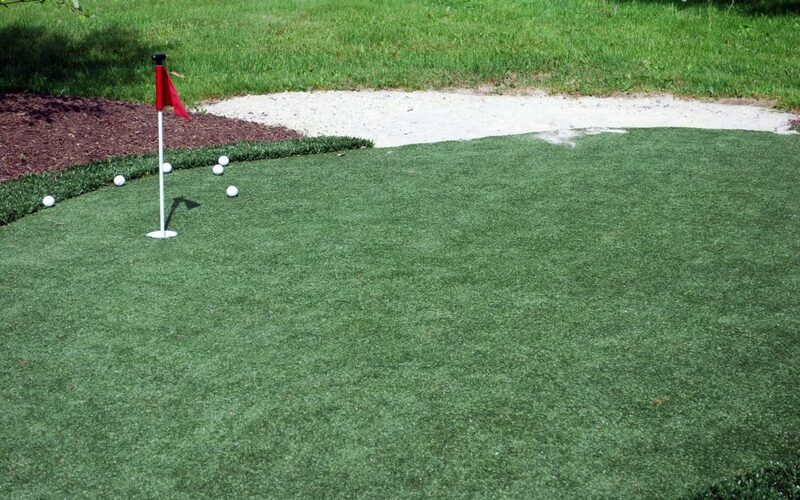 A putting green that is completely flat will get very boring very quickly. Besides, when was the last time you played a course where the green was completely flat on every hole? Talk to your landscaping company about adding a few undulations and mounds. If your budget permits, adding a sand trap or two can really take things to a whole new level. Having two or more holes at different ends of your putting green can also do wonders for your game. If your drive is the weak spot in your game, you can easily have a smaller section transformed into a tee-off area. Think of this place as your own personal driving range. If you plan to do this, make sure that you place the area far away from breakables (windows, pots, etc.) in the event of an errant swing. You’ll also want to purchase a fine mesh net to help keep your golf balls from ending up in your neighbor’s gutters.